First Potteries is a bus company based in Stoke-on-Trent operating services in North Staffordshire. It is a subsidiary of FirstGroup. 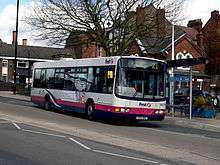 First Potteries now operates mainly urban services in and around Stoke-on-Trent, Newcastle-under-Lyme and surrounding towns. As of July 2014, there have been changes to route numbers & some buses have been repainted in the new livery as well as Wi-Fi being provided free of charge. The traditional colours of the PMT fleet were red and cream. During National Bus Company ownership in the 1970s and 1980s, poppy red and white livery was used. 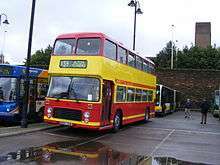 Following privatisation, the livery became red and yellow with the fleetname in a 'zipper' logo. Despite this, several variations were introduced to suit individual routes – Silverdale Shuttle and Bradwell Shuttle, which saw the red replaced with blue; Hospitalslink, a scheme used exclusively on a handful of minibuses and which was green-based; and Birches Head Townabout, again a minibus operation and which received a yellow and orange livery. Additionally, a pair of minibuses gained a purple and yellow variant to promote the Ball Green to Tunstall service. All these liveries have now been completely superseded by the FirstGroup corporate livery. In 2011 a number of buses were repainted in PMT red and yellow when routes 25 and 26 were launched as gold services. In 2010, FirstGroup changed the management structure of First Potteries. The Staffordshire area operations are now part of First Midlands (which consists of First Leicester and First Wyvern) with its group office at Adderley Green, Stoke-on-Trent. The Cheshire and Merseyside area depots became part of First Manchester. Crewe depot has been closed and has transferred vehicles and services to Newcastle-under-Lyme. In October 2013 First Potteries will take responsibility for First Midlands' depots in Hereford and Worcester in 2013. As at March 2013 the fleet consisted of 185 buses. 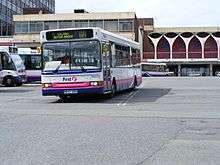 First Potteries received its first new buses in 8 years in 2014. 9 out of 10 Brand New Wright Streetlite Max MicroHybrid vehicles were delivered to Adderley Green Depot. The 10th will be delivered in 2015 as it is currently on tour with Wrightbus. This vehicle is the first with FirstGroup to have a Euro6 engine.